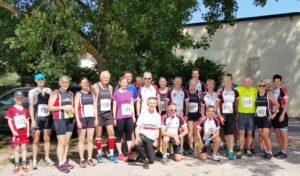 The lanes around Payhembury were the perfect setting for the first joint Honiton Spinners and Honiton Running Club Duathlon held on Sunday 3rd June. 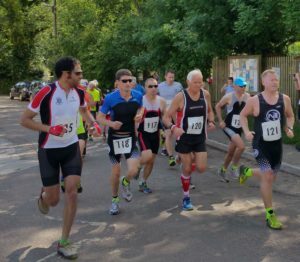 Cyclists and runners tackled the three-leg event consisting of a 3.82 mile run, then a 15.8 mile ride and, finally, a 2.41 run. Distances may not seem long, but changing from riding to running is surprisingly challenging. As one entrant said as she finished the ride and started the second run, ‘My legs feel all wobbly’. Several entrants completed all three legs, whilst others formed teams of runners and riders. It was a fun, social event for club members, but that didn’t stop wife and husband teams Paula and Adam Ferris tussling with Suzanne and Simon Spiller throughout the course. The Spillers edged home first only 40 seconds ahead, winning the Mixed Team prize. The youngest entrant, Ashley, joined Grandad Alan Nicholls and John Burgess to win the Male Team prize. There was just over a minute between the two female teams of Sharon Wells and Joanne Davey, and Claire Barrow and Mandy Ward. ‘It was tough in the hot and humid conditions,’ said overall female winner, Sherrie Hair, who completed all three legs in only 1.37.57 and was still smiling as she sprinted to the finish. The overall winner was Marcus Durrant, who breezed to the finish in a superb time of 1.34.09. Entrants, families and canine friends thoroughly enjoyed the morning, especially the wonderful cakes provided by members of the two clubs. Thanks go to Payhembury School and Hall for the use of their facilities, and to everyone who was involved, especially Roger Saunders.